In a recent article, we discussed the pros and cons of a multi-channel approach to marketing. In this article, we’ll discuss how you can accomplish each of these steps, in turn enabling you to reach out to and engage with your audience in the most effective way possible. You need to know where your customers are before you begin creating marketing content intended to engage them with your brand. It’s sort of an “if a tree falls in the woods” scenario: If you create an incredible marketing campaign, but your target audience doesn’t notice it, does it really matter how awesome it is? The first step toward discovering where your target audience “lurks” is to consider their on-paper profile: their demographics. 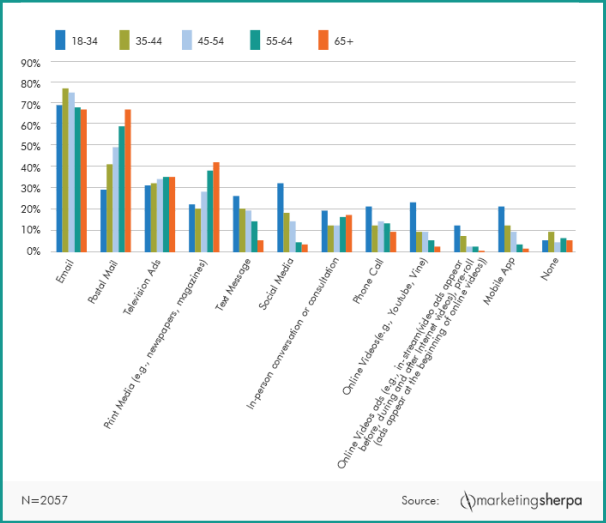 While some channels (such as email marketing) prove to be rather effective across multiple generations, other channels are more generation-specific. For example, nearly 70% of consumers age 65 and over prefer to receive marketing material via postal mail, while less than 30% of millennials prefer the same. On the other hand, more than 95% of those in the 65+ demographic don’t wish to receive branded content via social media – compared to about 32% of millennials that do. At some level, this is fairly obvious; in the same way that you wouldn’t market to older consumers using Snapchat, you also probably wouldn’t market to younger individuals via newspapers and magazines. Still, it’s worth digging into such data to be sure you’re on the right track before you commit to a specific channel (or selection of channels). You’ll also want to determine which channels will be most effective in terms of allowing you to get your message “out there,” and to engage with your target customers. Perhaps the best way to do this is to figure out where other companies within your industry have found success. No matter which industry you look at, you’ll notice that preferences tend to skew toward certain channels – and almost completely ignore others. As a retail/ecommerce company, Acme Inc.’s main focus is on spreading brand awareness and generating sales. Because of this, the company focuses its marketing efforts mainly on advertising its numerous products via social media ads and sponsored search results. The company’s marketing content typically includes information on a specific product and links to that product’s page on the company’s website. As a non-profit organization, Food4Kids aims to spread its message and spread the growth of its community via its marketing initiatives. To do so, the company creates blog posts and videos that educate its target audience about its mission and develops a Facebook group page where like-minded individuals can propose new ideas, plan events, and altogether further the organization’s cause. Neither organization would be all that likely to succeed in their mission were they to switch their marketing channels. These are not hard and fast rules. You could find success in a marketing channel that’s a little less common for your industry, or you could not end up experiencing success while using a rather popular channel within your niche. Start with a basic understanding of what your target audience expects and what’s typical for your industry – then dig deeper. For starters, learn as much as you can about your current customers by engaging with them further throughout their customer journey. Additionally, consider your offer, your message, and your overall purpose for reaching out – and determine which medium (or mediums) will help you effectively make this happen. Does my company have the capacity to be successful on this channel? Does your company have the logistical capacity to develop marketing content on this channel? Does your company have the creative capacity to do so? Take stock of the resources you have at your disposal that will need to be invested into your marketing campaigns for each channel. No matter which channel you choose to focus on, you’ll need to invest a certain amount of time, money, and energy (i.e., manpower) into creating your campaigns. Some campaigns might involve a trade-off, of sorts. Adwords campaigns, for example, are costly in monetary terms – but they’re typically not extremely difficult to get up and running. Content marketing, on the other hand, is a time-consuming venture – but it doesn’t cost much money at all, especially when done in-house. First, you want to determine which of these resources you’re willing (and able) to sacrifice to gain traction on a given channel. Budgetary concerns are a huge piece of the puzzle for large and small companies alike; you certainly don’t want to “go all-in” on one initiative and end up spreading your company too thin. Secondly, you’ll want to determine if the sacrifice you’ll be making is actually worth it. Again, industry standards can help you begin to understand the ROI of a given marketing channel, but you’ll need to look inward in order to gain a deeper knowledge of how your company might fare. Once you’ve done so for each of your potential marketing channels, you’ll have a much better idea of which you should focus on moving forward. Your ability to succeed on a given marketing channel also depends on your ability to create authentic and engaging content to be displayed on said channel. We’ve talked about the importance of authenticity when marketing to your target audience – as well as what can happen when a brand comes off as inauthentic via its marketing content. Simply put: you can’t force your brand into a channel in which it just doesn’t fit, or in which your marketing team isn’t prepared to dive into. That said, look for the channels you can enter seamlessly; the ones that simply make sense for your company. As we alluded to in our article on multi-channel marketing, as well as the intro to this article, you’re going to want to eventually aim to develop an omni-channel approach to marketing. Whereas with multi-channel marketing, brands simply become active on a number of different channels, omni-channel marketing is such that brands use these channels to create a single, cohesive experience for their customers. For a prime example of omni-channel marketing done right, check out this case study on Value City Furniture’s omni-channel approach to re-engaging cart abandoners. Essentially, the company used geofencing technology to identify individuals who visited a brick-and-mortar store but did not make a purchase. The company then reached out to these individuals via email to inquire about specific items they checked out during their physical visit. These customers were then able to save these items on a virtual “wishlist,” allowing them to quickly revisit the brick-and-mortar location to finalize the purchase. Such an innovative approach certainly stands out over the typical multi-channel experience in which, perhaps, makes their wishlist online and visits the physical store – only to be told the item is out of stock, and for the salesman to try desperately to get them to purchase something else. You should always be working toward de-siloing your marketing channels from the moment you start using them. In doing so, you’ll be able to keep your marketing team members on the same page at all times – in turn enabling them to provide an incredible experience to your customers.